Extracellular matrix proteins tenascin-C (TNC) and periostin, which were identified as T-helper cell type 2 cytokine-induced genes in human bronchial epithelial cells, accumulate in the airway basement membrane of asthmatic patients. Although serum periostin has been accepted as a type 2 biomarker, serum TNC has not been evaluated as a systemic biomarker in asthma. Therefore, the objective of this study was to evaluate whether serum TNC can serve as a novel biomarker for asthma. We evaluated 126 adult patients with mild to severe asthma. Serum TNC, periostin, and total IgE concentrations were quantified using enzyme-linked immunosorbent assays. Serum TNC levels were significantly higher in patients with severe asthma and high serum total IgE levels. Patients with both high serum TNC (> 37.16 ng/mL) and high serum periostin (> 95 ng/mL) levels (n = 20) or patients with both high serum TNC and high serum total IgE (> 100 IU/mL) levels (n = 36) presented higher disease severity and more severe airflow limitation than patients in other subpopulations. To our knowledge, this is the first study to show that serum TNC levels in asthmatic patients are associated with clinical features of asthma and that the combination of serum TNC and periostin levels or combination of serum TNC and total IgE levels were more useful for asthma than each single marker, suggesting that serum TNC can serve as a novel biomarker for asthma. Although the mechanisms of heterogeneous chronic inflammatory disorders of the airway, including bronchial asthma, are not fully clarified, airway inflammation and remodeling typically occur in these pathologies [1–3]. Asthma is characterized by inflammation of the airways associated with excessive deposition of the extracellular matrix, including basement membrane thickening, mucous cell metaplasia, epithelial shedding, angiogenesis, inflammatory cell infiltration, and smooth muscle cell and lung fibroblast proliferation . An increase in the number of lung fibroblasts characterized by collagen synthesis and in both tenascin and periostin deposition within the basement membrane matrix may occur in response to allergen challenge in asthmatic patients [5, 6]. Although a variety of cell types are involved in allergic airway inflammation, antigen-specific CD4+ T-helper cell type 2 (Th2) and type 2 innate lymphoid cells, which secrete Th2 cytokines such as interleukin (IL)-4 and IL-13, are believed to drive asthma pathobiology [7, 8]. Previous microarray analyses identified tenascin-C (TNC) and periostin as IL-4- or IL-13-induced genes in human bronchial epithelial cells [9–13]. Both TNC and periostin are glycoproteins that are secreted into the extracellular matrix. Previous studies suggested that periostin may promote eosinophil infiltration into the asthmatic airway during inflammation and serum periostin may be a systemic biomarker for eosinophilic airway inflammation and disease severity in asthmatic patients [6, 14–18]. It has also been reported that serum periostin has the potential as a prognostic biomarker to predict the risk of a decline in forced expiratory volume in 1 s (FEV1) in late-onset and eosinophil-dominant asthmatic patients [19–21]. TNC is prototypic of the TN family and supports the migration of inflammatory cells from the interstitium to the airspace. TNC is highly expressed in human lung during embryonic development, and its expression is especially strong in the extracellular matrix underlying the airway epithelium during the gestational stages [22, 23]. Although TNC expression is less abundant and more restricted in normal adult tissues, TNC expression in the airway subepithelial reticular basement membrane in asthmatic patients is prominently increased after allergen challenge and is a histopathological subepithelial marker to detect disease activity in asthma [24–26]. The thickness of TNC deposition was correlated with the number of eosinophils, T-lymphocytes, and IL-4-positive cells in bronchial mucosa of atopic asthmatics . Previous studies using TNC-deficient mice suggested that TNC provides protection against ovalbumin-induced Th2-driven airway inflammation . Moreover, treating asthmatics with mepolizumab, an anti-IL-5 monoclonal antibody for severe asthma, significantly decreased airway eosinophil numbers and significantly reduced TNC deposition in the airway subepithelial reticular basement membrane when compared with placebo . Furthermore, one report has been demonstrated that serum TNC levels were significantly higher in patients with refractory asthma than in non-refractory asthma and normal volunteers . Although these reports indicated that TNC in asthmatic patients may play a key role in Th2/type 2 airway inflammation, serum TNC has not been evaluated as a potential biomarker of Th2/type 2 airway inflammation and asthma. Therefore, in the present study, we evaluate whether serum TNC levels can serve as a novel biomarker for asthma. Consecutive patients with mild to severe asthma, who were aged 20 years or older, were recruited with informed consent from our outpatient clinic at Juntendo University Hospital (Tokyo, Japan). Asthma was diagnosed by a clinical history of episodic symptoms with airflow limitation and by either variation in pulmonary function monitored by forced expiratory volume in 1 s (FEV1) or peak expiratory flow (PEF) in accordance with the Global Initiative for Asthma (GINA) guidelines . The disease severity was also assessed in accordance with the GINA guidelines . The present study was reviewed and approved by the Juntendo University Research Ethics Committee (Tokyo, Japan). Written informed consent was obtained from each patient before their participation in the study. This study was registered in the UMIN Clinical Trial Registry (UMIN000009968) on February 5, 2013 (http://www.umin.ac.jp/). Patients having any of the following criteria were excluded: a diagnosis of chronic obstructive pulmonary disease defined by the Global Initiative for Chronic Obstructive Lung Disease guidelines  and any current respiratory disorder other than asthma. The asthma control test (ACT) score, pulmonary function parameters, and fractional exhaled nitric oxide (FeNO) levels were measured. FeNO levels were measured in accordance with the American Thoracic Society recommendations at a constant flow of 0.05 L/s against an expiratory resistance of 20 cm water with a chemiluminescence analyzer (NOA 280i; Sievers, Boulder, CO, USA). On the same day these clinical examination and venous blood sampling were performed. The sera of patients were collected after density-gradient centrifugation of blood samples and frozen at − 80 °C. Periostin levels were measured with an enzyme-linked immunosorbent assay (ELISA) (Shino test, Sagamihara, Japan), as described previously . TNC was simultaneously quantified in thawed serum using the human TNC ELISA kit (IBL Co. Ltd, Gunma, Japan) [33, 34]. Sample normality was examined using the D’Agostino–Pearson test. Differences in parameters between populations were analyzed for significance using Student’s t test, the Mann–Whitney U test, the Chi square test, and Fisher’s exact test as appropriate. For correlation between variables, the Pearson’s correlation coefficient and Spearman’s rank correlation coefficient, which is denoted as rs for a sample statistic, were used where appropriate. One-way ANOVA followed by the Tukey test and Kruskal–Wallis test followed by the Dunn test were used for multigroup analysis. Differences were statistically significant when P values were 0.05 or less. Statistical analyses were performed using Graph Pad Prism version 6 software (GraphPad Software, Inc., La Jolla, CA, USA). 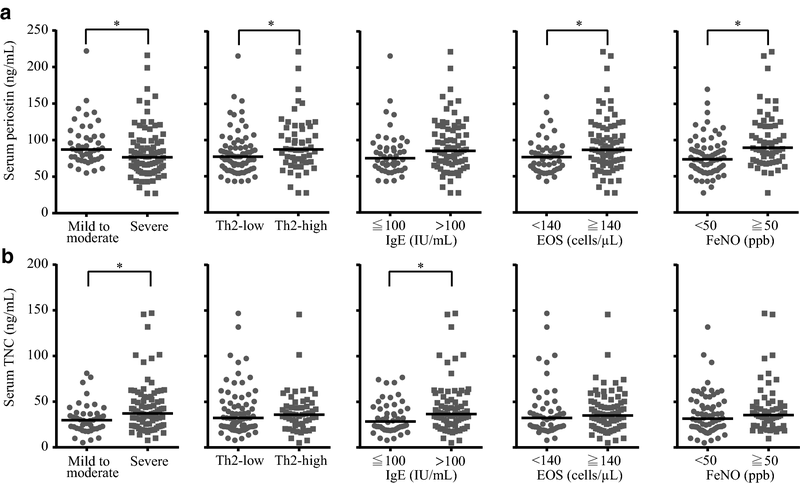 A Th2-high subgroup was defined as both a serum total immunoglobulin E (IgE) level of > 100 IU/mL and a peripheral blood eosinophil count of ≥ 0.14 × 109 cells/L [13, 35, 36]. We first determined the baseline characteristics of asthmatic patients (Table 1). This study enrolled 126 patients with mild to severe asthma, including 13 (10.3%) in GINA treatment steps 1 and 2, 32 (25.4%) in step 3, 57 (45.2%) in step 4, and 24 (19.0%) in step 5. The male to female ratio was 43:83, and the median age was 53 years (range 20–86 years). The mean (± standard deviation) duration of asthma was 18.83 ± 15.95 years, and the mean FEV1/forced vital capacity (FVC) ratio was 73.46 ± 10.3% (Table 1). We also compared the characteristics of 45 patients (35.7%) included in GINA treatment steps 1–3 (GINA step 1–3 group) and 81 patients (64.3%) included in GINA treatment steps 4 and 5 (GINA step 4 + 5 group) (Table 1). In the GINA step 4 + 5 group, the male to female ratio (P = 0.032), smoking history (in pack-years) (P = 0.003), ACT score (P < 0.001), FVC (P = 0.004), percent predicted FVC (%FVC) (P = 0.013), PEF (P = 0.037), FeNO levels (P = 0.037), and serum periostin concentrations (P = 0.012) were significantly lower than those in the GINA step 1–3 group. Conversely, the never-smoker/current and ex-smoker ratio which was performed by Fisher’s exact test (P = 0.002, data not shown), daily dose of inhaled and oral corticosteroids (P < 0.001 and P = 0.014, respectively), and serum TNC concentrations (P = 0.002) were significantly higher in the GINA step 4 + 5 group compared with the GINA step 1–3 group (Table 1). We next examined whether serum periostin and TNC levels in asthmatic patients were associated with subject characteristics. Serum periostin levels were positively correlated with age (rs = 0.261, P = 0.003), age at asthma onset (rs = 0.283, P = 0.001), ACT score (rs = 0.24, P = 0.007), FeNO levels (rs = 0.319, P < 0.001), peripheral blood eosinophil counts (rs = 0.36, P < 0.001), and the Th2-high to Th2-low ratio (rs = 0.195, P = 0.029) (Table 2). Although serum periostin levels were negatively correlated with the daily dose of inhaled corticosteroids (ICS) (rs = − 0.194, P = 0.029) and the percentages of GINA treatment steps 4 + 5 (rs = − 0.224, P = 0.012), periostin levels were also negatively correlated with airflow limitation, including FEV1 (rs = − 0.203, P = 0.023), the mid-maximal flow rate (MMF) (rs = − 0.25, P = 0.005), and percent predicted MMF (%MMF) (rs = − 0.195, P = 0.028). Moreover, in the GINA step 4 + 5 group, serum periostin levels were positively correlated with age (rs = 0.29, P = 0.009), age at asthma onset (rs = 0.316, P = 0.004), FeNO levels (rs = 0.226, P = 0.016), peripheral blood eosinophil counts (rs = 0.398, P < 0.001), and the Th2-high to Th2-low ratio (rs = 0.241, P = 0.03), but were negatively correlated with FVC (rs = − 0.29, P = 0.009), FEV1 (rs = − 0.295, P = 0.008) and MMF (rs = − 0.286, P = 0.01) (Additional file 1: Table S1). Serum TNC levels were positively correlated with the percentages of GINA treatment steps 4 + 5 (rs = 0.274, P = 0.002), daily dose of ICS (rs = 0.206, P = 0.02), peripheral blood neutrophil counts (rs = 0.189, P = 0.034), and serum total IgE levels (rs = 0.259, P = 0.003) (Table 2). These results suggest that serum periostin and TNC levels were associated with distinct subject characteristics. We then divided the 126 patients into two subgroups by five different ways: according to asthma severity (mild to moderate asthma and severe asthma), the Th2-high and Th2-low subgroups based on both serum IgE levels and a peripheral blood eosinophil counts, the high and low IgE subgroups based on serum IgE levels, the high and low eosinophil subgroups based on peripheral blood eosinophil counts, and the high and low FeNO subgroups based on FeNO levels (Fig. 1 and Additional file 2: Table S2). Serum periostin levels were significantly higher in patients with mild to moderate asthma (P = 0.01), Th2-high (P = 0.029), high peripheral blood eosinophil counts (≥ 0.14 × 109 cells/L) (P = 0.01), and high FeNO levels (≥ 50 ppb) (P < 0.001) [Fig. 1a and Additional file 2: Table S2]. Serum TNC levels were significantly higher in patients with severe asthma (P = 0.012) and high serum total IgE levels (≥ 100 IU/mL) (P = 0.026) (Fig. 1b and Additional file 2: Table S2). These results suggest that serum periostin and TNC levels were associated with different characteristics of asthma disease severity and Th2-related variables. Moreover, not only serum periostin but also serum TNC might have potential use as novel biomarkers for asthma. We evaluated whether the combination of serum periostin and TNC levels were more reliable than a single biomarker approach. Receiver operating characteristic curve analysis was used to determine the optimal cut-off value of serum TNC level to discriminate the GINA step 4 + 5 group from the GINA step 1–3 group, with the area under the curve of 0.665 (95% CI 0.57–0.76) (Fig. 2a). A serum TNC level of 37.16 ng/mL was the best cut-off value for the optimal potential effectiveness of serum TNC using Youden’s index . 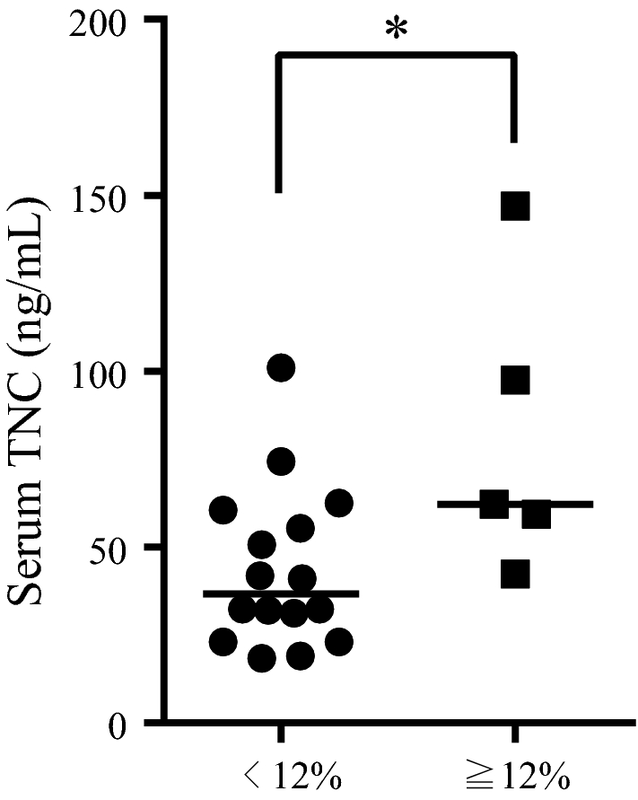 There were no correlation between serum periostin and TNC levels (rs = 0.111, P = 0.216) (Fig. 2b). We then divided the 126 patients into four subgroups according to the cut-off values for serum TNC (37.16 ng/mL) and serum periostin (95 ng/mL) (Fig. 2b, Table 3 and Additional file 3: Table S3) . In patients with high serum TNC and periostin levels, the percentages of GINA treatment steps 4 + 5 (P = 0.042), percentages of patients with aspirin-exacerbated respiratory disease (AERD) (P = 0.004), daily dose of ICS (P = 0.045), and peripheral blood eosinophil (P = 0.005) and neutrophil counts (P = 0.032) were significantly higher, whereas FVC (P = 0.01), %FVC (P = 0.019), FEV1 (P = 0.014), PEF (P = 0.045), MMF (P = 0.045), and %MMF (P = 0.042) were significantly lower as compared with patients in the other subpopulations (Table 3). These data suggest that the combination of serum periostin and TNC had the ability to reflect asthma severity and airflow limitation in asthmatic patients. We next evaluated whether the combination of serum TNC and total IgE levels were more reliable than a single biomarker approach, as described above for periostin. We also divided the 126 patients into four subgroups according to the cut-off values for serum TNC (37.16 ng/mL) and serum total IgE levels (100 IU/mL) (Table 4 and Additional file 4: Table S4). The percentages of GINA treatment steps 4 + 5 (P = 0.023), percentages of patients with Th2-high (P = 0.003), and peripheral blood neutrophil counts (P = 0.002) were significantly higher, whereas %FVC (P = 0.005), %FEV1 (P < 0.001), percent predicted PEF (P = 0.033), and %MMF (P = 0.01) were significantly lower in patients with high serum TNC and total IgE levels as compared with patients in the other subpopulations (Table 4). These data suggest that the combination of serum TNC and IgE also had the ability to reflect asthma severity and airflow limitation in asthmatic patients. Twenty-one (16.7%) asthmatic patients had been treated with omalizumab, a recombinant humanized anti-IgE monoclonal antibody for severe asthma, prior to enrolling in this study. Serum TNC levels in omalizumab-treated patients were significantly higher than those in patients not treated with omalizumab (52.72 ± 31.71 ng/mL versus 36.84 ± 22.94 ng/mL; P = 0.014), which corresponded to previously shown results that serum TNC levels were correlated with asthma severity and the daily dose of ICS. The mean duration of omalizumab treatment and median age were 26.89 ± 17.15 months (range 0.93–66.23 months) and 53 years (range 20–86 years), respectively. Finally, we investigated whether serum TNC levels were associated with the effect of omalizumab treatment. The 21 patients were divided into two subgroups according to change in FEV1 of more or less than 12% of baseline, i.e., the ratio of FEV1 at enrollment after treatment to baseline FEV1 before treatment. Only serum TNC levels showed a significant difference between the two subgroups among evaluated subject characteristics (Additional file 5: Table S5). Serum TNC levels were significantly higher in the subgroup with an improvement in FEV1 of ≥ 12% than that in the subgroup with improvement in FEV1 of < 12% (Fig. 3). Moreover, all of the patients with an improvement in FEV1 of ≥ 12% were included in the subgroup with high serum TNC levels (> 37.16 ng/mL) and serum periostin was not associated with the omalizumab-related improvement subgroup (Additional file 6: Table S6 and data not shown). The results of the present study confirm previous reports by showing that serum TNC concentrations in patients with asthma were associated with disease severity . Furthermore, to our knowledge, this is the first study to show that serum TNC levels in asthmatic patients are associated with clinical features of asthma and that using both the combination of serum TNC and periostin levels and the combination of serum TNC and total IgE levels in a multiple-marker approach might be a more useful biomarker for asthma. The present study demonstrated that peripheral blood eosinophil counts and total serum IgE levels were associated with serum periostin and TNC levels, respectively. Moreover, disease severity, percentages of patients with AERD, and airflow limitation were associated with patients with high serum TNC and periostin levels as compared with patients in the other subpopulations, suggesting that both periostin and TNC might serve as biomarkers of asthma. It was reported that the gene expression of periostin and TNC in bronchial epithelial cells is upregulated by Th2 cytokines, including IL-4 and IL-13, and that the secretion of periostin and TNC in lung fibroblasts is also induced by both IL-4 and IL-13 [6, 10, 11]. Both periostin and TNC bind to each other and also co-localize in subepithelial fibrosis in asthmatic patients . Although the production of both extracellular matrix proteins is induced by IL-4 and IL-13, it is interesting to note that different features were observed between serum periostin and TNC levels in asthmatic patients in the present study. IgE synthesis is also regulated by IL-4 and IL-13 [38, 39]. Previous report demonstrates that IgE in the bronchoalveolar lavage fluid are significantly decreased in ovalbumin-induced asthma mice model using TNC-deficient mice and that addition of exogenous TNC to mouse spleen lymphocytes stimulates IgE secretion . These data suggests that TNC has a potential of IgE synthesis. On the other hand, there are two reports using different periostin-deficient mice. One report shows that allergen-induced increases in serum IgE and airways hyperresponsiveness are exaggerated in periostin-deficient mice challenged with inhaled Aspergillus fumigatus antigen . Another report using periostin-deficient mice and anti-periostin neutralizing antibody shows that periostin is required for IgE synthesis and airways hyperresponsiveness in mice challenged with inhaled aeroallergen, house dust mite . These results suggest that periostin and TNC may have different function for IgE synthesis and may reflect their different features. Because both serum periostin and TNC levels were not correlation and had different features, the combination of serum TNC and periostin levels in a multiple-marker approach might be more useful biomarkers reflecting asthma severity including airflow limitation than a single biomarker approach. TNC is a matricellular protein that is highly expressed during wound healing and tissue remodeling processes in chronic inflammation, including asthma [24, 42–44]. The results of the present study demonstrated that serum TNC levels were not correlated with airflow limitation despite a correlation with asthma severity and high serum IgE levels, even when the asthma was severe. However, this study suggested that serum TNC levels may reflect disease severity in asthma and may be an indicator of airflow limitation in asthmatic patients with high serum periostin levels or high serum total IgE levels. Moreover, serum TNC levels were associated with peripheral blood neutrophil counts in the especially periostin-high subgroup or IgE-high subgroup, suggesting that serum TNC levels may reflect not only type 2 airway inflammation but also neutrophilic airway inflammation. High serum TNC levels have already some application as biomarker. Increased levels of serum TNC might be useful in liver fibrosis , inflammatory bowel diseases [46, 47], cardiovascular diseases [48–51], and refractory asthma . Serum TNC levels in patients with inflammatory bowel disease correlate with disease severity , and infliximab therapy response in patients with ulcerative colitis is associated with decreased levels of serum TNC . In patients with dilated cardiomyopathy, high serum TNC levels might indicate the severity of heart failure, left ventricular (LV) dysfunction and remodeling [48–50]. Moreover, previous report on acute myocardial infarction (AMI) shows that serum TNC levels in patients with AMI is significantly elevated, peaks at day 5, and then gradually decreases, and suggests that serum TNC levels might be useful in predicting LV remodeling and prognosis after AMI . These applications and the results of present study suggests that serum TNC might be a novel marker reflecting active structural remodeling in fibrosis, inflammatory bowel diseases, cardiovascular diseases, and asthma. In previous studies, the serum periostin level had potential as a single biomarker to predict eosinophilic airway inflammation and risk of a decline in FEV1 in asthmatic patients and was associated with late onset, high eosinophil counts, AERD, and chronic sinusitis [15–17, 19–21, 52]. Our results confirmed that high serum periostin levels were correlated with late onset and high peripheral blood eosinophil counts, but demonstrated that high serum periostin levels were not correlated with AERD and chronic sinusitis. However, the percentages of patients with AERD among patients with high serum TNC and periostin levels were higher than those in other subgroups, and serum periostin levels were correlated with AERD in the high serum TNC subgroup (data not shown). Furthermore, previous reports suggested that high serum periostin is associated with asthma severity [17, 18]. The present study showed that serum periostin levels were correlated with airflow limitation and showed a better correlation with airflow limitation in patients with severe asthma and high serum TNC levels. However, the present study also showed an inverse correlation between serum periostin and asthma disease severity, i.e., patients with mild to moderate asthma had high serum periostin levels. The reason for the discrepancy between serum periostin levels and asthma severity was not clear in the current study. This discrepancy may be related to dominant low FeNO levels in patients with severe asthma. Nevertheless, the findings of this unique subpopulation may lead to discrepant results between previous studies and the current study. Omalizumab, a recombinant humanized monoclonal antibody against human IgE, has important benefits as an add-on therapy for patients with inadequately controlled severe persistent asthma who have a significant unmet need [53–56]. However, not all patients with inadequately controlled asthma respond to omalizumab and predictors of response to this biological therapy are limited . It has been reported that serum IgE levels and antigen-specific IgE could not predict the response to omalizumab [58–60]. The EXTRA omalizumab study suggested the potential of three biomarkers of Th2-driven inflammation, including FeNO levels, peripheral blood eosinophil counts, and serum periostin levels, as predictors of the response to omalizumab to reduce the incidence of severe exacerbation . In the present study, we demonstrated that the omalizumab-related improvement in FEV1 of at least 12% was associated with high serum TNC levels, indicating that patients with high serum TNC levels may achieve a greater benefit from omalizumab therapy. There were several important limitations to this study. First, the lack of data of healthy subjects is a limitation. Second, for data on omalizumab treatment (Additional file 5: Table S5), serum TNC levels were evaluated after approximately 2 years from starting omalizumab treatment, blood samples were collected at different time points after starting treatment, and the sample size was small. Therefore, the data for omalizumab treatment should be considered preliminary. Further studies are needed to investigate whether serum TNC levels and/or the combination of serum TNC and periostin levels can serve as more useful biomarkers in asthmatic patients and whether it has the potential as a biomarker to predict the therapeutic efficacy of omalizumab for severe asthmatic patients. We have provided the first report that serum TNC levels in asthmatic patients were associated with clinical features of asthma and that the combination of serum TNC and periostin levels or the combination of serum TNC and total IgE levels were more useful for asthma than a single biomarker approach, suggesting that serum TNC can serve as a novel biomarker for asthma. Additional studies are needed to investigate whether serum TNC levels and/or combination with other markers are more useful biomarkers in asthmatic patients. YA, NH, RA, and KT participated in the design of the study and drafted the manuscript. YA, NH, SH, AI, YK, YI, KM, FM, JI, JO, KT, HA, RA and KI contributed to data collection. YA, NH, and SH performed the statistical analysis and interpretation of the results. All authors read and approved the final manuscript. KI reports grants from Shino-test Co. Ltd. during the conduct of the study; grants from AstraZeneca, outside the submitted work. In addition, KI has a patent effective only in Japan licensed. JO is an employee of Shino-Test Co. Ltd. The rest of the authors declare that they have no competing interests. The present study was reviewed and approved by the Juntendo University Research Ethics Committee (Tokyo, Japan). Written informed consent was obtained from each patient before their participation in the study. This study was registered in the UMIN Clinical Trial Registry (UMIN000009968) on February 5, 2013 (http://www.umin.ac.jp/). This work was supported in part by JSPS KAKENHI Grant Number 25461167. 13223_2018_300_MOESM1_ESM.xlsx Additional file 1: Table S1. Correlation coefficients for the association of serum periostin and TNC levels with subject characteristics, stratified by GINA steps. 13223_2018_300_MOESM2_ESM.xlsx Additional file 2: Table S2. The statistical significance and confidence intervals for serum periostin and TNC levels with asthma severity and Th2-related variables. 13223_2018_300_MOESM3_ESM.xlsx Additional file 3: Table S3. Characteristics of patients divided into four groups according to serum TNC and periostin levels. 13223_2018_300_MOESM4_ESM.xlsx Additional file 4: Table S4. Characteristics of patients divided into four groups according to serum TNC and IgE levels. 13223_2018_300_MOESM5_ESM.xlsx Additional file 5: Table S5. Characteristics of omalizumab-treated patients. 13223_2018_300_MOESM6_ESM.xlsx Additional file 6: Table S6. Omalizumab-treated patients to divide into 4 groups according to serum TNC and Periostin levels. Global Initiative for Asthma (GINA). Global strategy for asthma management and prevention. 2016. http://www.ginasthma.org/. Accessed 15 Nov 2012. Global Initiative for Chronic Obstructive Lung Disease (GOLD). Global strategy for diagnosis, management, and prevention of COPD. 2016. http://www.goldcopd.org/. Accessed 15 Nov 2012.